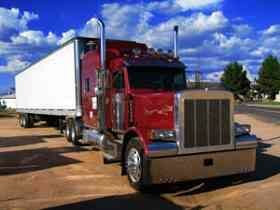 Now, your company has a large pool of loads to haul and a large pool of drivers to choose from everyday. Believe me, your company keeps track of their driver's reliability records and knows how important and difficult each of their loads are to haul. No company is going to give highly important, difficult loads to drivers that are unreliable. Once in a great while they may have no choice for one reason or another, but overall they aren't careless about which drivers get which loads. So say for instance there are three drivers sitting empty in a certain area and only two highly valuable loads are available. Yap, you guessed it, the two most reliable drivers are going to be making money that day, the third will be watching John Wayne movies at the nearest truck stop all day. But it goes a step further than that. Maybe there's three empty drivers and only two loads available, yet neither of the loads is too difficult or critical. Your company is still going to give the loads to the best two drivers available. Just as you would expect they are going to treat their better drivers better. Now take into consideration the discussion we had earlier about cheating the logbook. What if all three drivers are good, reliable drivers but the two loads absolutely MUST be delivered overnight. Say two of the three drivers are known to be willing to cheat the book in order to get the job done, the third has been known to shut down when he runs out of hours. Again, the company isn't going to risk it. You never know what circumstances may arise that would cause the drivers to run out of hours that day....traffic, weather, breakdowns, delays at the shipper, etc. So the two loads are going to go to the drivers which have the best possibility of making the pickup and delivery on time. Your company can't afford to risk it. Yet none of this will likely be discussed. Your company isn't going to say, “Hey, I don't care about your logbook, just get that load delivered on time.” Nope. What they're going to say is, “Hey this is an important customer and this load HAS to be delivered on time. Can you do it?” If you want to make the money, you're going to do it. If you're already a super rich John Wayne fan you might say, “Nope, I don't have the hours.” In that case, enjoy your movies! The other two guys will get the loads if they're willing to get the job done. Depending on the company you work for you may or may not have a hell of a time finding an empty trailer to use for your next load after dropping your loaded trailer at the customer. Another nice tip is with regard to finding empty trailers. Depending on the company you work for you may or may not have a hell of a time finding an empty trailer to use for your next load after dropping your loaded trailer at the customer. Most companies won't even assign you a load until you find an empty trailer first. Your company will help you locate one...eventually....but here's a scenario to consider. You drop your loaded trailer at the delivery and find there's another driver from your company already sitting at the same delivery location. He's sitting there without a trailer which right away has you thinking, “oh great....there's no empty trailers here.” Sure enough you're right. He already let his dispatcher know he needs them to find him an empty and they said they'll get back to him. Now you call in and let them know you've dropped your loaded trailer and need an empty also. If they're having trouble finding him one it may take a while before they get back to you.